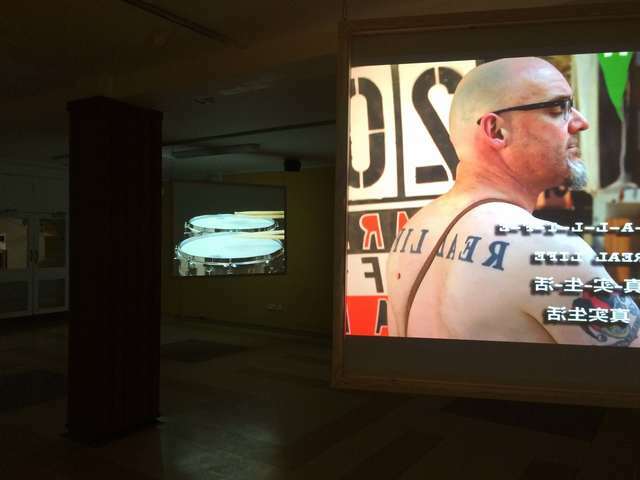 To celebrate the flourishing artists’ moving image practice in Scotland and the triumph of the international tour to China, a culminating event will be held on 17 February amongst a vista of moving image featuring all 24 artists’ works, illuminated by performances, readings and talks. The Culminating event is co-organised with British Council. 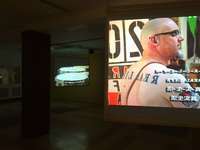 My film 'The Ballad of 20 Years of Real Life' is presented in a sculptural screen installation, with Chinese subtitles. 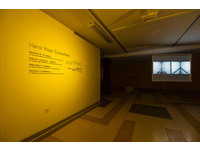 This work addresses the construction of a durational performance lasting nearly 25 years selecting a work from each year paid together in a song, in the key of A. How is longevity of artist's practice constructed and engaged with through audience engagement? How can this be used as a tool to inspire young people? 'Here' is fickle. Moving between different times and places, 'here' is nomadic and it is often an elsewhere. Inherently mobile, here and its elsewhere institute connections and routes of exchange. Here Was Elsewhere: >>FFWD holds these passages in the frame of the moving image, producing histories and memories of what was and could be. 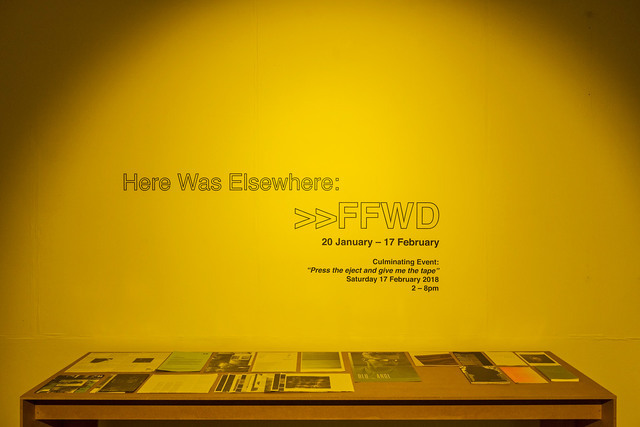 Displacing elsewhere into here, Here Was Elsewhere: >>FFWD is a reprise of Cooper Gallery’s International Project CURRENT: Contemporary Art from Scotland (Phase Two), in which >>FFWD was first shown at the Shanghai Minsheng Art Museum in 2016. Capturing the distinctive concerns driving contemporary artists’ moving image works made in Scotland, Here Was Elsewhere: >>FFWD evokes the body, history, time and narrative; the material of here and elsewhere. 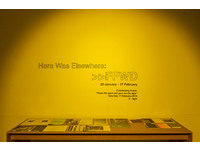 Featuring works made since 2000 by 24 up-and-coming and established artists, including winners and nominees of the prestigious Turner Prize, Max Mara Art Prize for Women, Margaret Tait Award and The Derek Jarman Awards, Here Was Elsewhere: >>FFWD is a panorama of a medium defined by the urgencies of the contemporary. 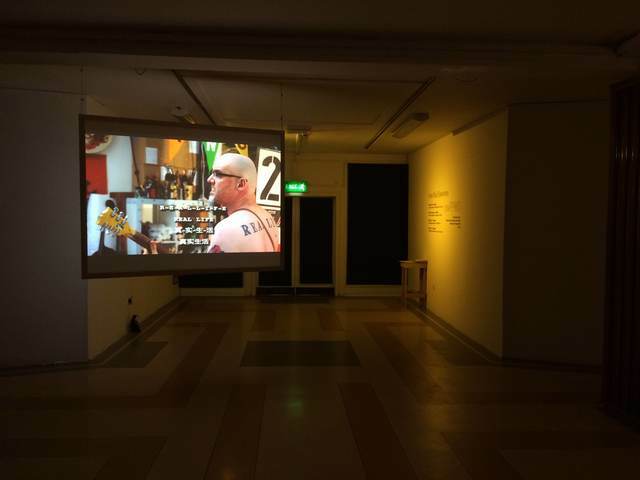 Cut together as a four-week ‘film strip’, the exhibition, with the camera as its medium, brings to clarity the diverse ethos of looking, recording and seeing that thrives in artists’ moving image practices from Scotland. Placing the eye and the gesture as intrinsic aspects of the moving image, the first week of Here Was Elsewhere: >>FFWD positions the human body as a question of place and situation. Acknowledging the voice and the materiality of sculpture, the second week evades history as merely an account of what has been, registering it instead as a concrete vocal presence. For the third week, Here Was Elsewhere: >>FFWD foregrounds the description of distance implicit in the moving image as an ephemeral grammar of time. Giving form to narrative, the fourth and final week focuses on methods and demonstrations as images that mediate practices of living into an ethos. The selection of works in the exhibition is supported by Modern Edinburgh Film School.